Every summer for as long as I can remember my mom, my sister and I have come up with "summer things" to occupy our time until school started up again in the fall. I've done painting, sewing, drawing, baking, and a myriad of other things, but my "thing" this year is, by far, the coolest. I rarely kept up with my projects once my summers ended, but this time I hope to keep it up for years to come. Creating clipart has been a fantastic experience! The main thing I've learned throughout my clip art "summer thing" is how amazing Photoshop can be! For quite a while I have loved using it to retouch photos, but I had no idea what other cool things I could accomplish with its wide array of tools and effects. My latest new ability: marble! 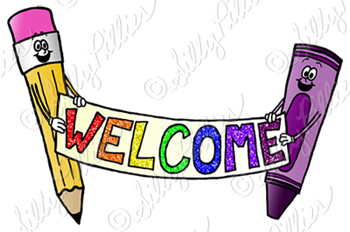 YouTube tutorials have become my best friends as I make my clip art as fun as possible. In addition to marble I've learned how to create tie dye, camouflage, glossy shine, and glitter. I have yet to think of a texture or pattern I couldn't find a tutorial for. I'm excited to see what I learn next! I'm working hard to finish up my game pieces set by Saturday. Keep your eyes peeled! My mom was working on one of her TpT products the other day and she asked me to make her a simple game piece. (Check out her store for some awesome spanish teaching resources!) She then suggested I create a clip art game pack full of dice and other common game pieces. I love games! Some of my favorite memories from childhood involve playing games with my family. My mom, sister and I enjoyed games like Apples to Apples and Blokus. Every visit to my Grandma's house still involves a good two hours playing her latest new game. Mexican train and Ticket to Ride have been some of my favorites. She's got quite the competitive spirit, and is so wonderful to be around. I didn't inherit that competitive side, but I definitely got her love for spending time having fun with family. I've moved this set to the top of my list, so feel free to put piece suggestions in the comments and keep your eyes peeled for a set packed full of gaming fun! My first big set is uploaded and ready to purchase! The Back to School Pack will be 50% off through Tuesday, July 29th, so get it before the price goes up! 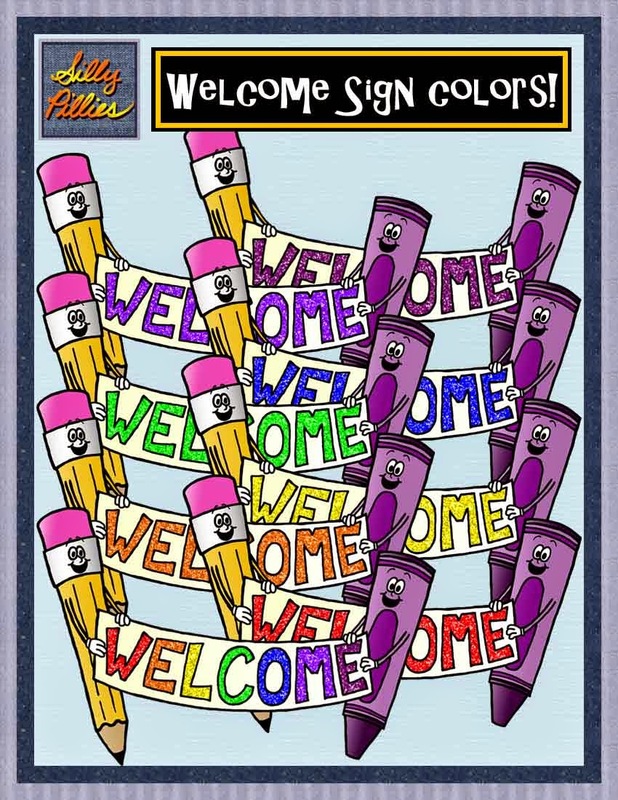 Chuck full of crayons, scissors, glue, lunch boxes, teachers and students, this set is great for welcoming your students to the new school year. 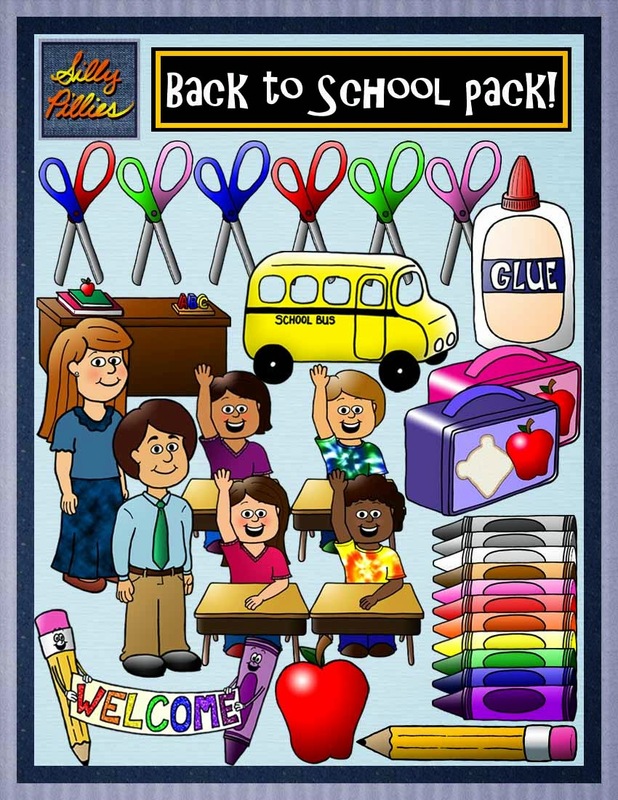 Check it out in my Teachers Pay Teachers shop! I had such a blast working on these images. 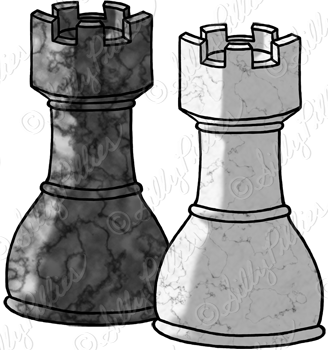 My style is slowly starting to develop, and I'm getting a little faster with each piece of clip art I create. I'm excited to see where this new adventure takes me! First steps out the gate! I'm so excited to start this blog! I haven't been successful at keeping up with blogs in the past, but I'm determined to make this one awesome. My shop on Teachers Pay Teachers has only been open for a couple days, and I am amazed at how many times my two freebie sets have already been downloaded! I will work on my first full set this week, in addition to perfecting my blog design, and hopefully have both finished by the weekend. Watch out, internet! 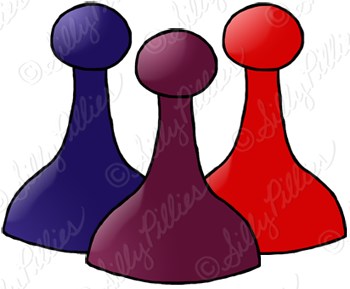 The Silly Pillies are coming to conquer you with cuteness!